1. Negative reviews are piling up and sales are down in many places. 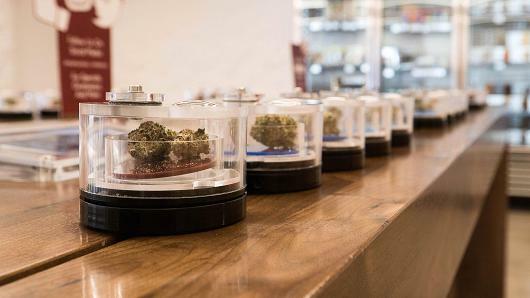 Poor customer critiques online – particularly on sites such as Yelp and Weedmaps, which help drive foot traffic for many licensed retailers – are hurting the bottom lines of some MJ businesses as customers complain about higher prices and limited product selection. Retailers in California’s large cities – where the illicit marketthrives in unlicensed brick-and-mortar stores and online – say they’ve seen an uptick in poor reviews and a 40%-70% decrease in sales since the regulations were implemented. “We can try to explain to people what’s happening and why,” said Adolph Ward, co-owner of Around My Way, a licensed delivery service in Oakland. “(But) customers couldn’t care less about regulations and legalization. And, some retailers observed, through no fault of their own, price and selection are why licensed players are taking a beating in reviews and losing customers to the illicit market. Other retailers – some in small cities – say they’ve fared better with sales, reporting increases or small losses. But regulations have caused the customer experience to suffer, they noted. 2. Customers are openly upset about costs and confused by regulations. Look at online reviews for some licensed dispensaries in California and you’ll notice a theme in comments posted after July 1, when the packaging and testing regulations took effect. They’re also angry or perplexed about the state’s 15% retail excise tax on medical and recreational marijuana. When the excise tax is tacked on to the average local sales tax, 23% or more is added to retail receipts for recreational marijuana. “We try to explain why these changes have happened, but regardless of what we say, customers still place the blame on us,” Kevin Reed, owner of The Green Cross dispensary in San Francisco, wrote in an email to Marijuana Business Daily. At The Green Cross, an eighth of an ounce of indoor flower retailed for $35 last year. That price increased to $46 in January, then dropped to $15-$30 in June when retailers were unloading product before the new rules kicked in. Now, an eighth of indoor flower retails for $32-$50 pre-tax. At Lakeside Herbal Solutions, before July 1, an eighth of indoor flower with a high percentage of THC retailed for $35, including sales tax. Now, those same eighths are closer to $62, including sales tax, state excise tax and the added costs of compliance throughout the supply chain. To keep pace with compliance costs, retail markups are at 100% across the board at The Green Cross, Reed observed. Before July 1, flower markups were reportedly 70%-80% and concentrate markups were 77%. While customers are feeling the pain of price bumps, retailers are hurting, too. Additional compliance costs have put some California vendors and cultivators out of business or scrambling to get their licenses approved. Available product is stuck in a bottleneck of lab testing. Only a handful of fully operational labs are running extensive tests on products statewide. Distributors are rationing what little product they have, allocating most to bigger dispensaries and larger cities. Or, they’re unwilling to drive long distances to deliver to smaller cities. That means there’s a shortage of compliant product industrywide, Reed said. Before July 1, The Green Cross had more than 40 strains of flower on its shelves. One day earlier this month, it had just 10. 4. Businesses are handling complaints in a variety of ways. Last month, Elizabeth Tabor, the owner of Mount Shasta Patients Collective in Mount Shasta and La Florista in the city of Weed, asked other California retailers on social media how they’re handling customer grievances. She got 123 responses, including a handful of helpful tips – some of which Tabor had already implemented in her dispensaries. For example, Tabor posted large signs in her dispensaries’ waiting rooms explaining the regulations. The signage has prompted conversations between customers and budtenders, who are trained to provide more details. She also printed postcards with the state regulatory groups’ contact information so customers can let them know how their retail experience has changed. Tabor also implemented a return policy. If customers don’t like a new product – one they’re trying as a replacement for something that’s unavailable – they can bring it back. Take time to explain the new regulations and the delays in lab testing. Emphasize they’re working with vendors to stock compliant, quality product. Update menus in real time on company websites as well as online sites. Encourage customers to monitor businesses’ social media pages, where the companies can share photos of new in-stock products – with a disclaimer for customers to call ahead about availability. Post in-store signage with expected arrival dates for new products. Ensure customers know the dates are subject to change.